Two universities will be hosting drone events at an upcoming air race. The University of Nevada, Reno and Embry-Riddle Aeronautical University are running a "drone zone" during the National Championship Air Races in Reno. The zone will feature classes by the U Nevada's Nevada Advanced Autonomous Systems Innovation Center (NAASIC) and NASA alongside an exhibit hall of unmanned aerial vehicle (UAV) and robotic vendors. 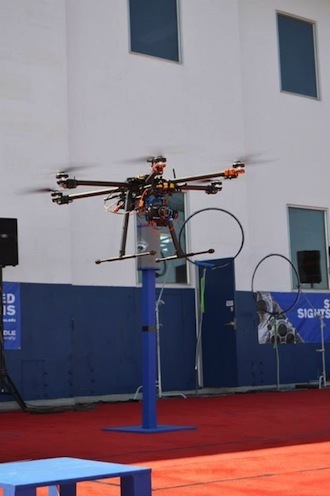 Embry-Riddle will operate the drone competition, which it also led last year. The Small Unmanned Aircraft Systems (UAS) event challenges hobbyists and professionals to maneuver their crafts through an obstacle course, lift weight and complete a time trial. This year's competition will be composed of two separate contests: an "Open Class" where competitors race their own drones, and an "International Race of Champions," where all participants will race identical drones provided by the school. The aircraft supplied will be a 180-size quad similar to a Dromida Ominus or Blade 180. "The objective of the small UAS Challenge is to educate the public on UAS operations and opportunities, as well as highlight Nevada's and Embry-Riddle's leadership roles in unmanned development and innovation," said Embry-Riddle Assistant Professor David Thirtyacre, who is the challenge coordinator. "It is great to give the public a taste of what our students are working on as part of the future of this exciting field." The challenge will be open to any private, academic or commercial participant. For the Open Class, the small UAS must be able to take off and land vertically, be less than 36 inches in major axis, less than 18 inches in elevation and weigh less than 10 pounds. The drones must use an electric propulsion, actuation and power system, controlled by remote transmission in the FCC unlicensed bands. About 3,500 students from the Washoe County School District are also expected to visit the Drone Zone during race week, where there will be classes on aviation. "This is an opportunity to get kids excited about these technologies and think about applying what they're learning in their STEM classes as a path to college," said Warren Rapp, director of NAASIC. NAASIC was established in 2014 with state money to provide collaborative space for entrepreneurs, researchers and commercialization experts focused on autonomous systems, including UAVs, driverless cars, stationary and underwater robotics and advanced manufacturing systems. It's led by the university's college of engineering.